My mother’s Bubby (grandmother in Yiddish, for the goy out there) was a terrible cook. While perhaps uncharacteristic of the traditional Jewish grandmother, her complete lack of culinary intuition and simultaneous love of cooking was endearing. Each time we visited her tiny apartment in the Bronx, she would sit us down at the dining room table and bring out dish after dish, each one drier and more flavorless than the last until finally, after picking our way through several courses of inedible gunk, she would bring out the blintzes. Blintzes, a staple in eastern Europe, were the only food Bubby could make well. Her expertise in creating the perfect crêpe-like pancake filled with fresh and sweet ricotta cheese may very well have compensated for her utter lack of talent in every other realm of cuisine. So we went to Bubby’s and we waited for the blintzes. For many years, the main consumer of Bubby’s unpalatable food was her neighbor and dear friend Pearl (pronounced “Poil”). Pearl, who was the same age as Bubby and who also lived in her building, would often cook and eat with her, somehow stomaching two of Bubby’s specialties, dry chicken and salt-less soup. Pearl and Bubby’s friendship extended beyond the kitchen. They would go on excursions to the park and the grocery store, they would see movies and concerts together, they met each other’s grandchildren. So when my mother noticed at some point that Bubby hadn’t been spending time with or speaking to Pearl, she was concerned. She probed Bubby to tell her what had happened between them, but Bubby refused to say, deflecting her questions and saying she didn’t want to talk about it. Years later, my mother discovered the reason behind Bubby and Pearl’s falling out. I hope you enjoy these delicious treats as much I always have, and if a close friend or relative claims that they have a better recipe for blintzes, you have my full permission to permanently cut ties with such a misguided imbecile. Flip the crêpe. Cook it for another 20 seconds, then slide it onto a plate to cool. Repeat with remaining batter, brushing the skillet with additional oil or butter as needed. You can stack the crêpes on top of each other even when they’re hot; they won’t stick. Either use the crêpes right away or cover the plate with plastic wrap and use them within the next 2 days. Make filling and fill wrappers: Mix all filling ingredients together until smooth. Place 3 tablespoons or so of filling across the center of the top wrapper/crêpe in your stack. Fold the bottom part of the wrapper up and over it. Fold the sides in over the bottom and filling, then fold the pancake up to form an egg roll-like shape filled pancake. 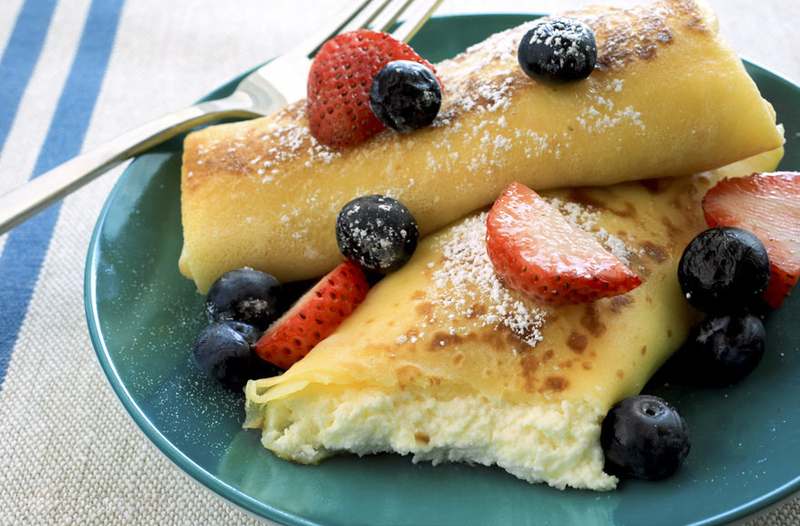 You can eat these blintzes right away, or refrigerate them for up to two days, or freeze them between layers of waxed paper for up to two months. To serve the blintz: Heat a pat of butter over medium heat in a skillet. Fry the blintz until browned on both sides. Transfer to a plate and serve with sour cream or a fruit sauce or jam of your choice.